I have a parrot, a yellow-collared macaw named Jethro. When I got her almost 16 years ago, she was just a homely little baby. 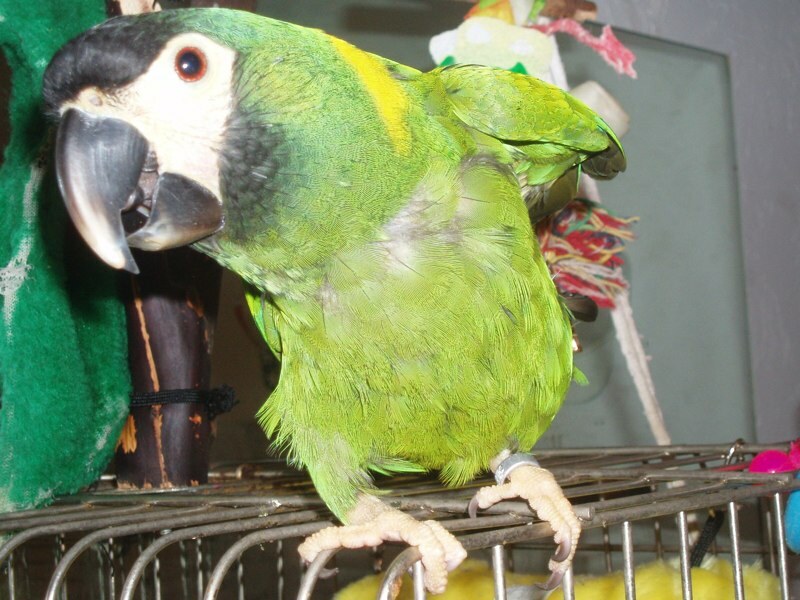 Astute readers might wonder how a female parrot got a name like Jethro. There's a perfectly good reason. When I first brought her home, I had to hand-feed her with a syringe. The care and feeding of a baby parrot is not a responsibility to be taken lightly, and for a while it seemed like I was constantly mixing up parrot baby food. One day I was reminded of an episode of The Beverly Hillbillies, an old 60’s sitcom that was in re-runs at the time, in which the Clampett family are in England. A snooty English lady says to Jedd, “I assume Jethro went to Eaton?” And Jedd replies, “Yes ma’am. I reckon he went to eatin’ about the minute he was born.” It just seemed too perfect, so the name stuck. In most parrot species it’s impossible to tell a bird’s gender without a DNA test. But for years, I assumed I’d made the correct guess for the logical reason that the bird had never laid an egg. Then one day about a year ago my mom, who was birdy-sitting for a few days, called to tell me she’d found an egg in Jethro’s cage. Imagine my shock. We let her sit on them for a few weeks then took them away. The bird didn’t seem to be any worse the wear for her ill-fated attempt at parenthood. The only one that seems to be having a hard time with the sudden switch of genders is my mom, in spite of the fact that she’s the one who found the eggs. She continues to refer to Jethro as “he” and says she can’t be female because she doesn’t act like a lady, although what exactly constitutes ladylike behavior in a parrot I’m not sure. I remember when Jethro laid an egg! ... Or two or three. I do recall you considered renaming this "medical miracle" Jethrine. In many ways this behaviour is consistent with the antics of one Jethro de Bodine...so for me Jethro will always be, well Jethro. Male birds can actually lay eggs. I used to raise cockatiels and have seen this before. I love my baby Oreo! Larry S.
How do you know Oreo is a male?